Humor me for a second: Picture yourself conducting a Google search for a local service. For the sake of the story let’s say it was to find an auto repair shop close by, and you’ll see that your search engine results page is inundated with local business listings with varying degrees of positive and negative online reviews. Now be honest… would you choose the shop with a glowing 5-star listing? Or the 2.5-star shop next door? I’m no mind reader here, but I think it’s pretty safe to say that you would choose to trust the 5-star reviewed shop with your only means of transportation, right? This simple illustration corroborates the fact that a whopping 97% of consumers say they actively research and read reviews about local businesses before making a decision and a recent study published in Psychological Science finds that if two similar products have the same rating, online shoppers will choose the one with more reviews. But here’s a somewhat alarming observation we discovered: In its “Small Business and Online Reviews Survey”, Yodle found that many small business owners, unfortunately, don’t put that much stock into feedback. In fact, only half of the 300 respondents reported that they believe that their positive online reviews were important and nearly one in four went so far as to say they felt online reviews were inconsequential. Hate to break it to you but unless you’re Joan Jett, as a business owner you definitely SHOULD give a damn about your reputation… especially when it comes to your reputation online. Let’s dig into 5 reasons why your online reviews can make all the difference towards the success of your business. 85% of consumers trust online reviews as much as personal “word-of-mouth” recommendations from their peers. Trust is of paramount importance to consumers who are potentially parting with their hard-earned money, and building that trust in every way shape and form should be your number one concern. You can talk about yourself all day long with the greatest marketing materials and well-written “about” pages on your website, but most people will put more weight and stock into what others say about you. Word of mouth is, has always been, and most likely always will be one of the strongest points of persuasion for consumers… although the methods have become increasingly digital in nature. A recent study conducted by Dimensional Research found that the buying decisions of 90% of respondents who read online reviews were influenced by positive reviews, while 86% were influenced by negative reviews. A corroborating study by Reputation X revealed that businesses with mostly one and two-star online reviews failed to convert roughly 90% of their prospective customers. Can you afford to have 90% of your potential business choosing your competition over you for the simple reason of poor, or lack of, reviews? I think not. The Dimensional Research study from above also found that 86% of consumers say they would even pay more for a service provider with more positive reviews instead of choosing the less expensive provider with a lower rating and a recent study conducted by Cornell University found that a hotel can raise its prices by about 11 percent for every one-point increase in its star rating without losing customers. Also, it’s been proven that there is a direct correlation between online reviews and conversion rates. ALSO also, customers spend 31% more overall with a business that has excellent reviews. Cultivating a brand loyalty through positive reviews creates repeat customers… which means increased/sustained revenue for your business. Mull all that over for a minute as we move on to reason number 4. If you own a business, you’re more than likely already aware that local search ranking is a highly competitive arena. Every website is in a constant battle to dominate the 1st page because more than 67% of all clicks go to the top five listings. 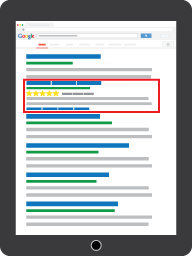 But in an interesting development, star ratings displayed in local search results generate higher click-through rates than organic search results. A recent study by the geniuses at Moz unearthed the variety of ranking factors that influence local search rankings and they discovered that online reviews definitely influence where a business appears not only in Google’s Local 3-Pack results but also in localized organic search results. Another bonus, the more online review sites that list your company, the more quality backlinks your website attracts. All things considered, positive online reviews will give you the competitive edge you need in local search results… and every little bit helps. White House Office of Consumer Affairs found that loyal customers are worth up to 10 times as much as they were at their first purchase… and a happy customer is a loyal customer. However, research conducted by global management consulting agency, Accenture found that 89% of customers get frustrated because they need to repeat their issues to multiple representatives. When someone takes the time to leave an online review of your business, it’s a major opportunity to gain valuable insight into your overall customer satisfaction, a clear picture of what your customers expect of you, and whether or not you are meeting those expectations– and take immediate action to keep your customers happy. It’s also a major opportunity to glean more information on who your customer base is, what is important to them, what their pain-points are, etc… This information can be directly applied to marketing strategies, advertising, business development, and more. But What Do I Do If I Have… (gulp) Negative Reviews? Real talk: Negative reviews ARE going to happen every now again, especially because most people (myself included) will actively seek out a business’ review sites if they’ve had a negative experience. But the way you handle these negative reviews will make all the difference in the world. Respond immediately in a respectful, professional manner and see if there is any way you can make the situation right. In some cases, reviewers will update their reviews to a higher rating if their needs are met and may advocate for you as having excellent customer service. But even if they don’t and there are irreconcilable differences, other readers will see that you care and take an active role in customer satisfaction. Another step to take is to be sure that your positive reviews outnumber the negative reviews. It never hurts to ask for reviews- ask for them often. But here’s the catch: Wait until the sale is complete and customers have had time to try your products and/or services before you do ask. You’ll find that many customers are willing to provide an online review if you tell them that you take reviews very seriously and actively monitor them to help analyze overall customer satisfaction. Make sure it’s easy for your customers to find your links to your review listings, especially Yelp, Facebook, and Google– which are local consumers’ most trusted review sites. Your competitors have the same services as you and are vying for the same customer base. Markets are volatile and rankings fluctuate, but your online reviews are one aspect of your business that you can actually control– and neglecting to actively cultivate and maintain a good reputation can be extremely detrimental. You can’t afford to ignore it. Need help monitoring and improving your online reputation? Contact us for more information on our all-encompassing Online Review solutions.